Secret KGB archives released in Ukraine show that there were problems with the Chernobyl nuclear plant before the 1986 explosion - the world's worst civilian nuclear disaster. The 121 documents - dating from 1971 to 1988 - include a report from 1984, which notes deficiencies in the third and fourth reactors, and also the poor quality of some equipment sent from Yugoslav companies. There are also references to an incident at the plant in 1982, in which small doses of radiation were released. The explosion on 26 April on the fourth reactor released 100 times the amount of radiation of the bombs dropped on Hiroshima and Nagasaki put together. The Chernobyl accident led directly to the deaths of 30 workers at the reactor site, caused the hospitalisation of hundreds of others and exposed about 6.7 million people to radiation fall-out, according to the World Health Organization. This led to a 10-fold increase in thyroid cancer among children in affected areas. The declassified KGB archives were published on the internet site of Ukraine's Security Service on the eve of the 17th anniversary of the disaster. They contain a report by the Ukrainian KGB directorate to Moscow on systematic safety breaches during construction works between 1976 and 1979. They also include a report sent to Moscow on the day of the explosion, in which the then Ukrainian KGB chief, Lieutenant General S Mukha, says that his department "had taken control of the situation in the plant and the surrounding area". The general also says that "almost the entire population of the town of Prypiat (more than 44,500 people) was evacuated" by 28 April. 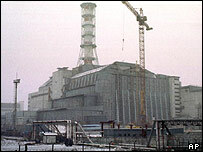 The Chernobyl plant remained in service until December 2000, when it was finally shut down under pressure from the world's richest nations. A 30km (18 mile) exclusion zone around the site is still maintained although there is some talk of trying to generate tourism opportunities in the area.